SNG TV supplies SNG satellite uplinks and camera crews in Australia. Victoria, Australia, February 2018: The broadcast services company, SNG TV, is equipped to cover live events from almost anywhere in Australia, no matter how rugged the terrain. 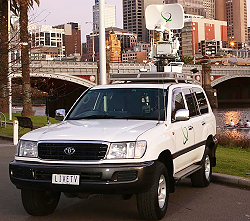 With its 4WD SNG vehicle and microwave link trucks, along with portable ‘Fly-Away’ SNG satellite equipment, the company is ready to broadcast news wherever it occurs. The owner-operators of the company have over 50 years of combined experience. Cameraman Jarod Pinder has worked in a fast-paced news environment covering live domestic and world news and sports events for the past 27 years for all of the Australian broadcast TV networks and international channels. Link technician Nick Manolios has over 30 years' experience in both microwave and satellite uplinks. Nick has also travelled Australia and internationally extensively on various assignments. SNG TV, which is new to promoting its services on TVZ, says its primary objective is to facilitate the highest quality live broadcast services available.